Growing a great vegetable garden involves juggling the needs of dozens of different crops. Some like it hot while others prefer cool spring or fall growing conditions, but figuring out when to plant what — and where — just got easier. 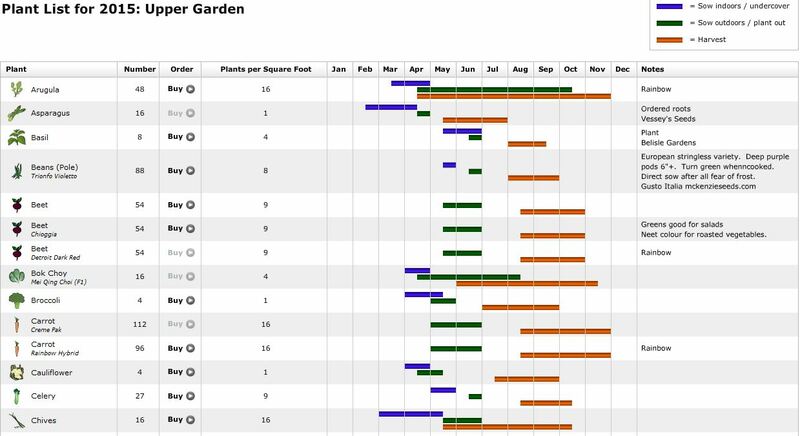 With the help of our interactive Vegetable Garden Planner, you can quickly get the data you need to design your best garden ever — and it’s all free for 30 days. To get all the same great features on your iPad, try our Grow Planner app. Find the average first and last frost dates for your area, based on records from over 5,000 weather stations across the United States and Canada. All you have to do is punch in your ZIP code, and the Garden Planner software does the rest. If your experience in your micro-climate points you toward different dates, you have the option of setting the frost dates yourself. The Planner will use these dates to tell you the best planting times for more than 130 garden crops. This function is a great one to use during the free 30-day trial. If you want, the Planner will even send you twice-monthly reminders about what crops to sow and plant from your plans. Get a personalized planting chart. Once your plan is complete the software compiles a chart showing how many of each plant you need to buy or raise from seed, the correct spacing and recommended planting dates for your area. You can print both the plan and plant list as a handy reference to take into your garden. Plan succession sowings. If you plan to grow fall carrots after spring peas, or plant fall garlic in the same space used for summer snap beans, you can incorporate end dates for certain plantings into your plan. The plan will then show available space for a second crop. Plan crop rotations. Plants are coded according to the botanical family to which they belong, and the Garden Planner keeps track of what you have grown where. When you plan next year’s garden based on this year’s plan, the Planner will warn you if you try to follow tomatoes with potatoes, squash with pumpkins, or otherwise violate standard rotation practices. Plan cover crop plantings. The Garden Planner includes several common cover crop varieties for improving soil. Keep track of varieties. You can quickly change from generic labels such as “lettuce” to specific variety names such as ‘Red Sails.’ Then you can make notes in the Garden Planner about what happened with different varieties over the course of the season. The notes will be stored so that you can refer to them during the next planting season. If you grow any unusual plants then these can be added as varieties of the generic plant symbols such as “fruit bush,” “herb,” etc. Now it’s time to see the Vegetable Garden Planner in action. You can view instructional videos or sign up for the free trial — no credit card or personal information beyond a valid email address is required. Your first 30 days is free, then the Planner costs only $25 per year ($40 for 2 years) if you choose to continue. We think you’re going to love how this interactive software can streamline and improve the garden planning process.